Posted on May 21, 2015 by Barry V.
A breezy, sunny day as I found my way to the new trailhead at Rocky Hill Wildlife Sanctuary in Groton. I had read about the heron colony there, and knew the birds would be sitting on eggs about now. As I neared the power line crossing on the way to the heronry, I heard the clear, plaintive notes of a field sparrow. 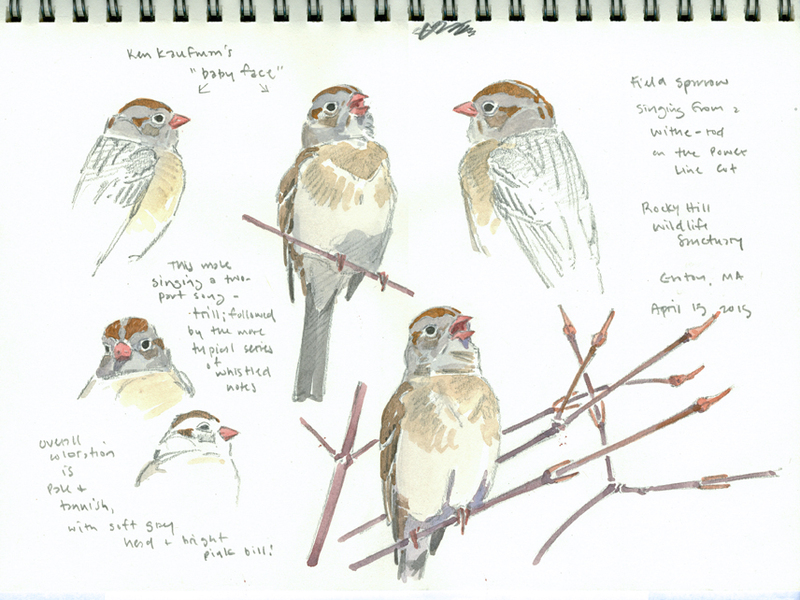 I located the bird singing from a shrub under the power lines and got a scope on it quickly to do some drawings. In Ken Kaufman’s bird guide he uses the term “baby-faced” to describe the facial expression of this species. It’s an apt description, and I strove to get that sweet, innocent expression in my drawings. Field sparrow habitat is shrinking in New England and I encounter them much less frequently these days. Power line cuts, with their predominance of shrubs and other early successional growth, seem to be one of the most reliable places to find them. This bird was singing from a withe-rod, so I detailed the distinctly shaped pinkish-tan flower buds and “Y” shaped twig configuration. In this watercolor (done back in my studio), I also wanted to convey the soft, high-key colors of early spring in New England. 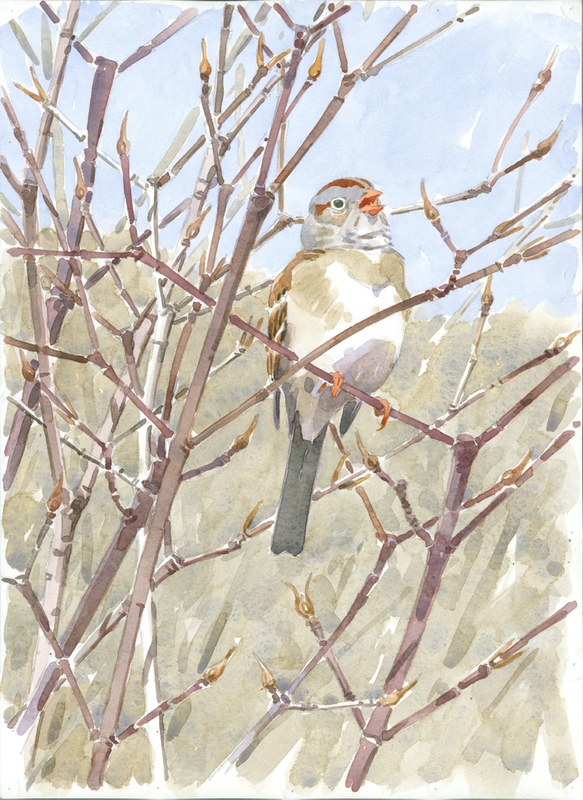 This entry was posted in Artists, Barry Van Dusen Residency, Natural History and tagged Barry Van Dusen, Birds, Emberizidae, field sparrow, Groton, Rocky Hill Wildlife Sanctuary, Sketching, Watercolorsr, Withe-rod on May 21, 2015 by Barry V..